It has been a long time since I came across an opinion piece in this newspaper that made me feel such a wide range of emotions, thoughts and feelings. 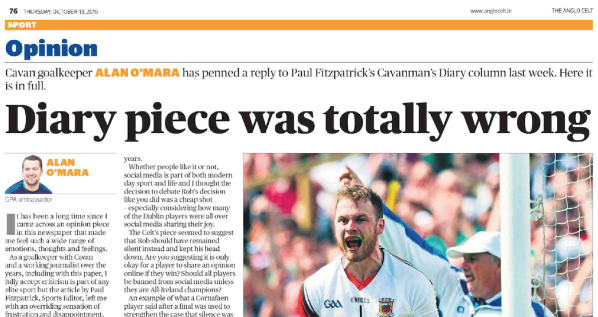 As a goalkeeper with Cavan and a working journalist over the years, including with this paper, I fully accept criticism is part of any elite sport but the article by Paul Fitzpatrick, Sports Editor, left me with an overriding sensation of frustration and disappointment. The piece questioned and mocked the fact that Mayo goalkeeper Rob Hennelly took to social media to explain how he was feeling in the aftermath of the most disappointing day of his sporting career – a bizarre opinion to find in a newspaper that has regularly published tweets from members of the Cavan team over the years. That however was only the tip of the iceberg as the social media bashing continued with Rob made out to be the chief villain. C’mon Paul, you are better than that! I am yet to meet a GAA player that goes out of his way to help other people just for attention. The reality is that so many GAA players around the country visit sick children, sign cards, offer up jerseys for raffles, deliver motivational talks and fully embrace the responsibility that comes with being a role models for young and old for nothing other than genuine reasons. About 1% of this collective good makes it into the public domain and as a seasoned journalist and staunch journalist, not only should you know that, but also you should know better. I don’t know Rob that well but he seems an interesting guy. He is confident and outgoing and the Managing Director of his own company. I am clearly not the only one to think that because over 14,000 people follow him on Twitter and Instagram. Media, and journalists in particular, often moan about the lack of personality and individuality in the modern game and for me, Rob is an exception to that sterile norm. When I read his initial statement last Monday, I thought to myself, ‘what a classy guy’. It was clear he was trying to process and move on from what happened rather than wallow in self-pity for days like I have and many others over the years. Whether people like it or not, social media is part of both modern day sport and life and I thought the decision to debate Rob’s decision like you did was a cheap shot – especially considering how many of the Dublin players were all over social media sharing their joy. The Celt’s piece seemed to suggest that Rob should have remained silent instead and kept his head down. Are you suggesting it is only okay for a player to share an opinion online if they win? Should all players be banned from social media unless they are All-Ireland champions? An example of what a Cornafaen player said after a final was used to strengthen the case that silence was the best policy but the black and white contrast you portrayed was worryingly narrow-minded. When a player invests so much physical, mental and emotional energy into a football campaign for so long, the process of losing a final is one often compared to a period of grieving by sports psychologists around the world. Many Olympians talk about the difficulties they have coping with that after the conclusion of the games too yet the piece I read in last week’s Anglo Celt failed to grasp that each athlete will process successes and failures differently. It took courage for Rob to send out what he said last week, admit his vulnerabilities and I think that is to be commended. At the end of the day GAA players are just like everyone else – they have feelings and emotions too. I have no doubt that Rob and indeed the rest of his teammates were feeling low in the aftermath of losing the biggest GAA game of the year. If that post helped him to move on from the emotional and mental scars, then why should the media have a problem with that? Goalkeeping can be a cruel position at times and the highs and lows are often more extreme than other positions of the field. The one thing that all goalkeepers have in common though is that we have all made mistakes. Stephen Cluxton, the greatest goalkeeper that has ever played GAA, has fluffed his lines and cost Dublin before. On the same weekend as the All-Ireland final replay, I saw David De Gea cough up a soft goal for Man United and Ter Stegen did the same for Barcelona. However, those mistakes were not scrutinised as intensely and personally as the incident in the Dublin-Mayo final despite the fact that they are well paid international goalkeepers. The opinion pieces from the likes of Joe Brolly and the Celt have played up stereotypes and showed scant regard for individuality of athletes. Every player wants to be the best they can be but I personally believe, as a GPA wellbeing ambassador, that the best someone can be is when they are true to their own personality and character. Just because Cluxton is quiet and withdrawn, or because Brolly played with a great goalie twenty years ago that was understated doesn’t me we all have to be that way. So much work is being done all around Ireland to encourage people to accept themselves, to shatter stigma and break down many different stereotypes but I felt much of what was said about Rob after the game wanted to superglue the blinkers back on peoples faces. The GAA as a game has changed an awful lot in recent years, and with that, whether you like it or not, so too have our players. No GAA player is asking for a free-pass from criticism but a little empathy and compassion would go an awful long way. Who knows, if journalists and media could rediscover those attributes maybe Rob Hennelly would have explained his thoughts and feelings in the aftermath of the game through an interview with a journalist and not had to use social media to get his message out there. Just some food for thought old friend….